Hello my sweet babes! Can you believe how warm it is getting? It is prime hair deodorizer season I tell you what! And guess what other season it also is? Club Volleyball season! 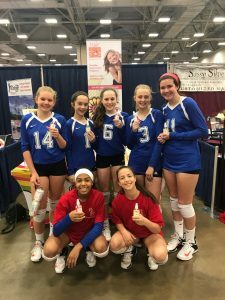 Check out these wonderful girls who we met last year at the Lone Star Classic volleyball tournament. Unfortunately we are unable to attend this year, but that doesn’t mean we love our volleyball gals any less! This week I’m all about Watermelon hair perfume. It’s practically summer time and sweat season is here. The more I sweat the more I want to smell like sweet sweet Watermelon hair deodorizer. I know you might be confused from me continuing to use the word deodorizer. Like, Amy, I thought this was a perfume? And you’re right! But it also masks the smells you don’t want just like a deodorant you would use for your body. My hair perfume does not leave behind any residue nor does it leave your hair feeling greasy. How amazing! So go ahead and give Watermelon hair spray a try this week and let me know what you think of the sweet and delicious scent in the comments. Feel free to also keep me updated on what activities you will be getting into this Spring! I can’t wait to keep up with all of your achievements.